Apart from Latin America, Russia has recently reinvigorated its efforts to project its influence around the world, especially in other areas where its influence has declined. Russia has demonstrated its increasing leverage in Latin America with Foreign Minister Sergei Lavrov meeting representatives of the Community of Latin American and Caribbean States in Moscow on Wednesday. 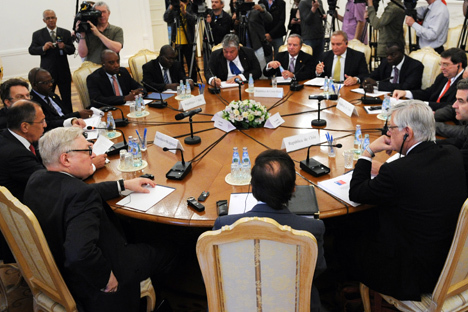 The foreign ministers of Cuba, Costa Rica and Haiti and the deputy foreign minister of Chile discussed trade, political dialogue and a visa-free regime with Lavrov, with everyone in agreement that Russia's relations with the region are ripe enough to establish "a permanent mechanism for political dialogue and cooperation in a Russia-CELAC format," a statement from Russia's Foreign Ministry said. CELAC was founded in 2010 as a counterweight to the U.S.-led Organization of American States. It consists of 33 states representing almost 600 million people and producing $7 trillion in annual GDP. "This is a serious attempt by Latin American states to counter U.S. economic and political influence in the region," said Mikhail Belyat, an independent Latin American expert and lecturer at the Russian State University for the Humanities. Foreign Minister Sergei Lavrov discusses trade and a visa-free regime with the foreign ministers of Cuba, Costa Rica and Haiti. In the aftermath of the Cuban Revolution, the Soviet Union rapidly increased its economic and military influence in Latin America only to see that influence subside with the collapse of the Soviet Union. To that end, Russia has been actively promoting the concept of a multi-polar world, playing an active role in such organizations as the BRICS and the Eurasian Economic Space, which is planned to be transformed into a full-fledged Eurasian Union in 2015. "Our friends have expressed their desire to make permanent contacts between the CELAC and BRICS. Particularly on the sidelines of various meetings. We believe this is a very attractive suggestion and we will definitely discuss it with other states that are members of this association," Lavrov said at the news conference that followed negotiations. BRICS consists of Brazil, Russia, India, China and South Africa, representing large, fast-growing economies with an increasing influence on global affairs. Just like BRICS, CELAC countries have enjoyed strong economic growth of 4.5 percent on average over the last three years, which in turn drives these states to look to distant markets. "Like Russia, these countries want to diversify their economies and export markets so that their goals complement each other," Belyat said. Trade between Russia and Latin America reached $16 billion in 2012 alone. In order to complement the exchange of goods with the exchange of people, the sides have agreed to put their efforts into establishing a visa-free regime between CELAC countries and Russia. Although Russians already enjoy visa-free travel to most countries of Latin America, including Brazil, Argentina and Chile, Costa Rica and Panama still require Russian citizens to apply for entry clearance in advance. Russia has been negotiating visa-free entry for its citizens for some time now, with the most well-known process taking place with the EU. Russia has noted that the EU already grants visa-free access to such countries as Brazil, Mexico and Venezuela — countries which enjoy a similar level of economic prosperity as Russia. As the bureaucratic process in the EU drags out visa-free negotiations, Moscow is looking to other regions to expand its influence. "We used to have hectares full of Lada cars along the Panama Canal, while our tractors were plowing Mexican lands," Belyat said. "So I predict Russia will become more prominent in Latin America, and we will see more Latin American goods in our stores."